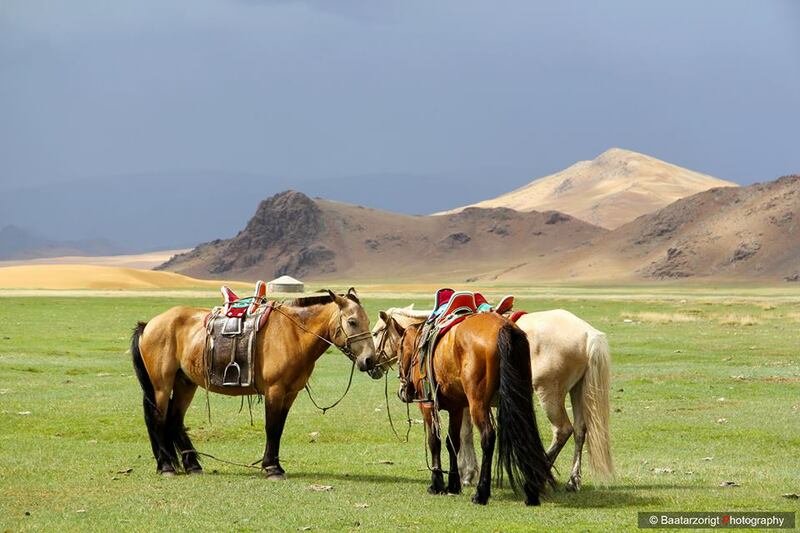 Mongolia is a land of horses and herdsmen and one of the last great, undisturbed wilderness areas on earth. Among its 2.9 million people are some of the last truly nomadic pastoralists in the world – but how long they will survive is questionable. About one-third of the scant population is concentrated in the capital, Ulaanbaatar, whereas the dwindling population of nomads, herdsmen with their millions of head of livestock, are spread throughout the country. The people are well matched to the land they inhabit, they are tough, resilient, stoical by dint of necessity, but genuinely fun-loving, easy going and kind. Since earliest times, tribes have moved across the great central Asian plains and mountain ranges that cover present-day Mongolia, but little is known of the ethnic origins of the proto-Mongol people. The mystery lies tangled in the fact that we are dealing with a fluid and changeable nomadic society. The division between Inner and Outer Mongolia (Outer Mongolia being a historical concept only, no longer the country name) was effected by the Qing dynasty Manchus of China (1644–1912), who conquered southern (Inner) Mongolia before northern (Outer) Mongolia. This has resulted in differences between the two areas. Mongolia’s vast steppe is home to one of the world’s last surviving nomadic cultures. Situated between China and Russia, the Mongolian steppe remains mostly intact, and its nomadic way of life has been largely unchanged for generations.The people of the steppes have adopted a pastoral way of life moving in the search of best pastures and campsites Mongolia’s vast steppe is home to one of the world’s last surviving nomadic cultures.The nomads' life changed very little since old days and Mongolia remains the last refuge of the pastoral nomadism, preserving and continuing the traditional cultural heritage of the many nomadic nations that once flourished on the present day territory of Mongolia. Today the nomads who remain on the steppe combine old traditions with new means. They se solar energy to power television sets, use of mobile phones, which, for parents, are the only way to stay in touch with their children attending boarding schools in the city. During the summer, children return to the steppe to help their families maintain the herds, and some come back to live in the steppe after finishing their education.